I do not want to bring in Goan and Non–Goan issue here. But I am certainly referring to the gradually decaying spirit of a Goan to live in Goa. Selling out small shops to the big business houses, selling acres of land to the industrialists from outside Goa, giving preference to work in a hotel rather than setting up a small scale business is a normal trend. Often Goans are termed as SUSEGAAD (relaxed) people. Quite a few Goans even take great pride in calling themselves SUSEGAD. These people get up late; go to the office late and do not forget their long afternoon siesta. SUSEGAAD has become a qualification for most of the people around me. All the shops and establishments would be closed from 1 o'clock to 4 o' clock, not only in the villages but even cities like Panaji, Margao, and Vasco (I remember, recently I had to travel 6 kilometers to purchase a regular medicine for fever). In a way, Goans are a happy and easy going community. They are not chasing the material world. They are quite happy with the circumstances they live in. At the same time I also see so many young Goans working in shops for a meager salary of Rs. 2000 or Rs 3000. Many more are even unemployed. Quite a few are waiting for the opportunity to move to the Middle East or work in a hotel on a beachside. I live at a beachside in Goa. What I learn that most of the beachside hotels or shacks are owned by Non- Goans. Barring few exceptions, Goan boys and girls prefer to work in these hotels. If one takes a look at Panaji city, we realize the shops belonging to the older generation of Goans are sold out to the people belonging to other parts of the country. I do not want to bring in Goan and Non-Goan issue here. But I am certainly referring to the gradually decaying spirit of a Goan to live in Goa. Selling out small shops to the big business houses, selling acres of land to the industrialists from outside Goa, giving preference to work in a hotel rather than setting up a small scale business is a normal trend. Are we Goans not intelligent enough to understand that being SUSEGAAD has destroyed us more than anything else? This term SUSEGAAD actually means relaxed. But I think in Goan context it needs to be interpreted as LAID BACK. This is the reason Goans are not ready to work hard. This is the reason Goans hesitate to take a risk and set up their own business. This is the reason Goans prefer to work as an employee than as an employer. We need not blame others for this. We ourselves need to be blamed for our own disaster. Goa is slowly turning into a home for Non- Goans. It is growing fast as a metro city. Significant number of Goans have made Mumbai, Toronto, Dubai, Kuwait or other Gulf countries as their home. As of now, thankfully, majority of Goans are still residing in this tiny state called Goa. However, in Venice, majority of locals have migrated to other parts from this city. I hope Goa does not become another Venice. Kitem re patrav hya disaani kaay baraylem naa mare tuvem. Samkod sussegad zalo kay kitem re, Goyakarabashen? Thanks Mr. Laxmikant Shetgaonkar for your short but strong message. I note the adverse comments regarding the author . Goans v/s non-goans from a movie maker who has used non-goan artists in his movies. Aren't these sensitive movie makers should write some more creative stuff. This guy may be a great movie maker and might have won international awards, etc. but he writes absolutely rubbish. Laxmikant Shetgaonkar is a Goan filmmaker of international repute, presently shuttles between Goa and Mumbai. He has created history with his first Konkani film “Paltadacho Munis” (A Man Beyond the Bridge) winning the most prestigious FIPRESCI award, also known as Discovery Award of the Critics, at Toronto International film festival in 2009. 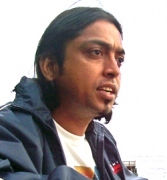 His first short film “Eka Sagar Kinari” had also bagged a National Award, the first one for Goa once again, in 2005. Laxmikant graduated in Theatre Arts from Kala Academy, Goa. He was an Actor-Teacher at India’s prestigious theater training school, National School of Drama, New Delhi. Overwhelmed with the quality of world cinema, he decided to take up the medium of cinema to express his concerns. He has also started a cinema movement in Goa, by forming Entertainment Network of Goa. He has also directed many more films. He has figured in the Top Ten youngest achievers of India in Sun magazine in 1995. His profile and activities are available on his website http://www.laxmikant.net . » Goa may lose IFFI "permanently"
» What is so 'great' about New Year? » R u a Konkani?